Stephanopoulous noted that Trump said he had consulted with “my generals and military experts,” and concluded that “the United States government will not accept or allow transgender individuals to serve in any capacity in the U.S. military.” The reason, despite a Pentagon-commissioned study that said otherwise: “Our military must be focused on decisive and overwhelming victory and cannot be burdened with the tremendous medical costs and disruption that transgender in the military would entail. Stephanopoulous noted that the Chair of the Joint Chiefs of staff said he’s going to wait for an official order from the president before the Pentagon moves forward; the commandant of the Coast Guard said he’s backing his transgender servicemembers; and Sec. of Defense General Mattis, who was on vacation, was apparently blindsided by Trump’s tweet. “So what I want to know is specifically which generals and military experts signed off on that tweet from the president?” Stephanopoulous asked. 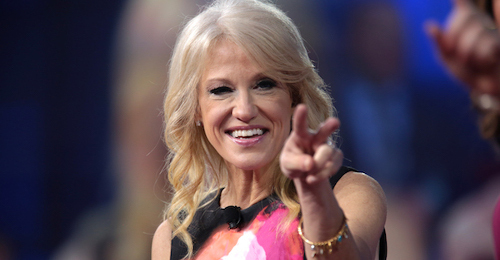 Conway repeated herself and obfuscated, noting that “the Pentagon is a big place. If you find five or 10 people who say, we had no idea, 100 people say we had no idea, that doesn’t mean that everybody there who needed to know. I don’t know when everybody at the Pentagon found out, but the president has made very clear what his policy is. “The next steps, George, as you know, are to have policy guidance and to put the order out and to work with the stakeholders, obviously General Mattis — Secretary Mattis and others, to implement this new policy,” she said. Stephanopoulos asked again, which generals signed off on the tweet before Trump sent it out? Stephanopoulos did not ask about those stakeholders, which included the Family Research Council, to whom Trump had apparently made a promise about trans servicemembers. “That’s what he’s doing. He’s only doing what he committed he would do,” Perkins said. Conway did not put it in those same terms, or identify FRC or any of Trump’s Religious Right advisors, but deflects to President Obama. Sources familiar with the Guidance say the new policy has passed muster with the White House Counsel’s Office but has not yet been sent to Defense Sec. Mattis.